of this/ “my” this – you think – Alice turns to you and says so. 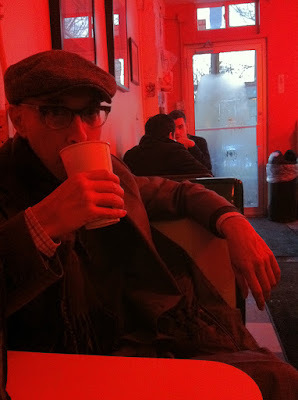 Mark Goldstein [photo credit: K. Hill] is the author of three books of poetry published by the award-winning BookThug: Form of Forms (2012); Tracelanguage (2010); and After Rilke (2008). His poetry and criticism have appeared in both trade and limited editions as well as in periodicals and journals such as The Capilano Review, Brick, Open Letter and Jacket2. Goldstein has facilitated workshops at the Toronto New School of Writing, SUNY Albany, and lectured on translation at George Brown College, York University, and in Paris at the École des hautes études en sciences socials. Before becoming a full-time writer, Goldstein played drums alongside Leslie Feist and Broken Social Scene’s Brendan Canning in the indie rock band By Divine Right.